Save 20% with this coupon. Enter code BESTRACK at checkout. Constructed from durable steel. Incorporating “Simple is Best” concept into functional stylish design. Stores cutting board sized up to 12″ wide by 18″ tall. Detachable Hanging Hook and Basket design increases multi purpose usages. Innovative tilting storage design concept makes putting cutting board, cookie pan, muffin pan, and all bakeware more easier. 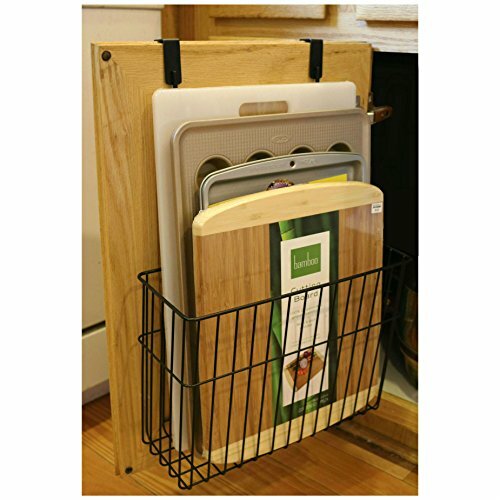 Looking for a over-the-cabinet door organizer to store your cutting board, bakeware, kitchen supplies etc…? This organizer is constructed from durable steel. Incorporating “Simple is Best” concept into functional stylish design. Stores cutting board sized up to 12″ wide by 18″ tall. Detachable Hanging Hook and Basket design increases multi purpose usages. Easy to attach or detach; no tool required. Innovative tilting storage design concept makes putting cutting board, cookie pan, muffin pan, and all bakeware more easier. Stylish black color matches any kitchen, bathroom, or office. Non scratch coating protects stored items from being damaged. Optional foam pads for hooks are included to add additional protection for your cabinet door. Organizer measures 13-1/2″(W) x 6″(D) x 20″(H), Basket measures 13-1/2″(W) x 5″(D) x 9-3/4″(H), Hook unit measures 9-1/2″(W) x 1″(D) x 10-1/4″(H) approximately. 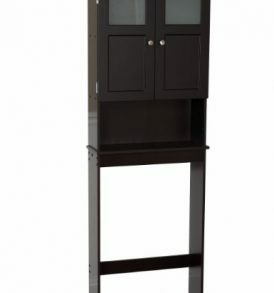 Organizer can also be hung outside of your cabinet door. If planning to hang organizer inside of your cabinet, please make sure size dimension can fit. Patent pending. Stylish black color matches any kitchen, bathroom, or office. Non scratch coating protects stored items from being damaged. Optional foam pads for hooks are included to add additional protection for your cabinet door. Organizer measures 13-1/2″(W) x 6″(D) x 20″(H), Basket measures 13-1/2″(W) x 5″(D) x 9-3/4″(H), Hook unit measures 9-1/2″(W) x 1″(D) x 10-1/4″(H) approximately. Organizer can also be hung outside of your cabinet door. If planning to hang organizer inside of your cabinet, please make sure size dimension can fit.